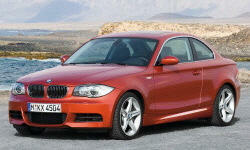 BMW 1-Series Pros and Cons | Page 1 of 2 | Why Not This Car? I wanted a 128 I with manual, sport package and xenons. It was not an easy car to find but I was glad to have one. Many cars I have trouble writing about, especially within TrueDelta's format, because they're so similar to many competitors that hardly anything sticks out as a high or a low point. Getting the same 3.0 liter turbo as the 335i but in a smaller package. Looks cast from metal; rich paint; classy when top up or down. Side, front, back views match BMW ideal. Might be best achieved of the Chris Bangle designed bimmers. Car feels comnnected to the road - inspires confidence. 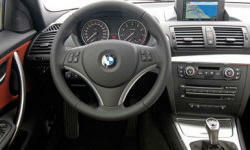 128i has more than sufficient power & torque to put a smile on a drivers face. 300 horsepower (and 400 horsepower with the added DINAN software upgrade) is unbelieveable! Smooth linear power for a turbo vehicle. Tons of torque, easy to modify for additional performance gains. Very tight, well balanced for daily driving. Can really attack those corners. There is a lot of low end torque, making it a great daily driver. Very smooth, powerful quick to rev. Strong smooth performance yet without the complexity of a turbo. Same powertrain as the 3 series, but smaller and lighter.